Summer is a great time to relax, but also to learn and grow in ways that aren’t always possible during the school year. 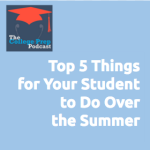 Gretchen and Megan each share their top 5 lists of things students should do over the summer to grow as people, and also get themselves ready for college. Although their lists were slightly different, one common element is that students should be STRATEGIC about how their summer activities help set them up to be thriving adults with amazing lives.